I wrote this article after a request to GGJ organizers to tell stories about your own location. It got published on the GGJ page, as well. You might have heard of Leipzig as a game city, once. Until 2009 the GDC Europe and the Games Convention were hosted in the capital of Saxony, Germany. But since it moved to Cologne in 2009 (and was renamed to “Gamescom”), there was not only a huge convention missing. The absence of game developer events were visible and it hurt to realize that the city became unimportant for the developer scene. Besides, Leipzig has a sparse population of game companies – few of them dedicate their 100% manpower to game development only. But even without company clusters, big names, game events and conventions, we have a very cool monthly regulars' table hosted by René Meyer, who owns the world's biggest retro console collection. Usual visitors are professional game devs, journalists, a twosome who owns the Retro Games Store, a company that has Germany's biggest board game distribution, musicians, amateur game devs and indies like us. But we still have very few to no events where game devs exchange and show their skills. Although we knew of game jams like Ludum Dare or the Devmania Overnight Contest, we never heard of the Global Game Jam – until we met Zuraida (GGJ Dir) in Berlin at the local BIG Jam, where we learned about this global madness. Totally enthusiastic to participate in the Global Game Jam I started a web search for locations near Halle/Leipzig. Error. The next local event was in Berlin. So we did something I totally hate, but which was necessary to be part of the jam: we searched for rooms and became organizers ourselves! Together with Klaus Bastian from the local university HTWK we started the first GGJ location ever in Leipzig. Now that we got the location and the knowledge to set up everything there was only one thing left for completion: people. Where the hell would we get people for a jam from a city that has no huge game developer community? René and Klaus started everything super-professional and sent out press releases to local newspapers and it worked! They responded and wanted interviews to learn more about the event. Afterwards, people I never heard of appeared on the website and subscribed to be part of this new jam thingy. When the jam started on Friday, the 27th January 2012, people showed up and we managed to develop seven games. Yes, I'm talking about seven games here! But the jam was not only about creating games. Thanks to the event we got to know new people, exchanged addresses for future works and finally had our own one-weekend game development event in the year. Additionally to the jam we opened up the “dev cave” on Saturday for visitors, introduced the open development not only to families with their little game-devs-to-be, but also got new people interested for the upcoming jam. This event worked out so well, we continued encouraging people to jam with us the following year. 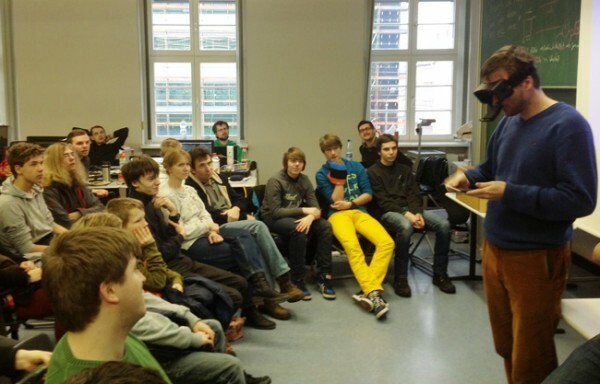 2014 we are going to host the third edition of the Global Game Jam in Leipzig and everybody is super excited. We want to grow and try to find even more interested people from around Leipzig. Thank you, creators, executives, directors and admins behind the Global Game Jam. You guys encourage local scenes with this amazing concept of worldwide jamming! Because of your already established concept and infrastructure you motivate us to get out of our holes and force us to find like-minded people. And the greatest thing: it doesn't matter if there was or is an already big scene. Go create your own location, or make more of the already established ones!